When I am traveling, I always find it important to look and feel my best. If it is a business trip, I’ve likely got clients to impress. It if is a vacation, I will probably be posing for pictures that I will treasure for years to come. But looking and feeling your best on the road can be challenging since you don’t have access to the grooming products and tools you have at home. Fortunately, there are some fantastic cosmetic organizers for travel on the market. They make it easy to bring not only your essentials but some specialty products as well. Prepare your makeup, skincare products, hair care products, and jewelry and get ready to go. This case is pretty large, a good choice for longer trips or for anyone who is slightly make-up obsessed! It features a large, deep main compartment, which is segmented into smaller compartments for easy organization. The partitions can also be reorganized, so you can customize the interior to your needs. You can separate products by eyes, lips, and face, or by cleansers, make-up, and application tools. The inside of the top of the case features brush holders so that you can keep your expensive brushes separate from the rest of your supplies. The case sits open nicely, so there is no need to unpack it every time you want to use a cosmetic. You can just unzip it, and see everything right there right in front of you. The lining is soft and the material is water-repellant, which will protect your products in-transit. An overall great solution for anyone looking to transport a lot of products safely. This cosmetic case is much smaller (only slightly larger than the palm of your hand) but can still hold quite a few cosmetics in a nicely organized way. 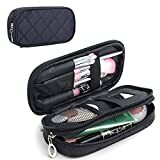 This case has two main zipper compartments, one for cosmetics like moisturizers and make-up, and a smaller one with partitions for brushes, applicators, and a small mirror to check your work. 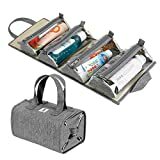 If you are not a makeup fiend but still want a well-organized way to transport the items you do use, this is a fantastic solution for you. It is made of water-resistant nylon, so you can place slightly damp moisturizers and brushes in your bag without worry. This is a medium-sized bag that features one main, segmented compartment. The bottom of the case is deep and comes with padded, adjustable dividers so that you can make the work for the products you have. The inside of the top features one zippered mesh compartment, so you will not be able to separate your brushes individually. However, you will be able to keep them away from your larger products that may harm them in transit. This is another case that sits open nicely, so you will not have to unpack it every time you are trying to find a specific item. It also comes in a really fun flamingo design, and the interior is a nice light pink that will really make the designs and logos on your cosmetics pop. This is a great solution for anyone looking to bring most of their collection, but maybe not everything. This is another smaller organizer. It features two zipper compartments, one for cosmetics and one for jewelry. The cosmetic compartment features some segmented partitions for brushes and eyeliner/mascara, along with a bucket section for your creams, powders, toners, and moisturizers. 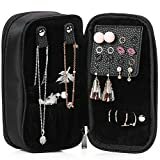 The jewelry compartment features a few loops to keep necklaces in place, an elastic-closed pouch for bracelets, some pinholes to secure earrings, and a padded bar to slide rings onto. This case is small, but powerful, and will really allow you bring everything you need to adorn yourself in order to feel your best. It comes in seven color options, so you can even display an element of style in the case you choose. This bag is large and in charge. It comes with 5 massive compartments, so you can hold not only your makeup but your toiletries too. The entire case folds down into a case roughly the size of a laptop case, if not a bit wider, but when you unfold all of the compartments, you wind up with a large center compartment, two winged compartments, and the inside of the top lid – more than enough space for anything you may want! The inside of the top lid also has a hook that allows you to hang the case on a towel rack or bathroom bar. 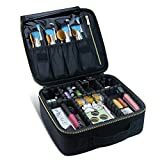 Each zippered compartment features it’s own partitions, so you will have space for your brushes, your smaller cosmetics, your larger cosmetics, and anything else you may want to store and carry with you. To be exact, the case comes with 1 super-sized main compartment, 8 mesh pockets, 1 see-through pocket, 6 larger rubber loops, 4 side compartments with a total of 10 small rubber loops. This is the perfect solution for anyone who likes to bring everything with them. 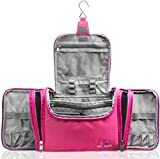 This makeup bag consists of four removable compartments. They all sit on one mat and roll up into a tube-shaped bag. With this, you can organize your makeup into four categories for transport. Then you can unroll it at your destination to see everything without having to unpack it. If you ever want to take just your SPF or just your powders and brushes with you in a purse, you can easily un-velcro one of the sections. This is a great option for anyone who values visibility and flexibility! You can also check out our other article that features additional organizers. Grab anything you need to transform yourself into what makes you happy. Pack it up and hit the road!